The Diamonds hitmaker will be recognised with MTV's top prize for her impact on music, fashion, film, and philanthropy at the New York City ceremony later this month (Aug16). Celebrating the news on Thursday (11Aug16), Rihanna, who will also perform at the prizegiving, took to Twitter to write, "Honored to take the #VMAs stage as your video #VANGUARD award recipient LIVE from NYC on August 28!" The superstar follows in the footsteps of previous winners including Justin Timberlake, Beyonce, and Kanye West, who was handed the trophy last year (15). The Video Vanguard recipients typically perform a medley of their hits at the live awards show, but in 2015, Kanye used his stage time for a lengthy speech, during which he announced plans to run for the White House in 2020. 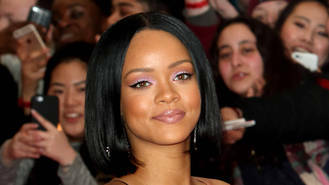 Details about Rihanna's performance plans have yet to be revealed. The singer will also have the opportunity to take home up to four more VMA accolades - she is nominated twice in the Best Collaboration category for her track Work, with rapper Drake, and her appearance on Calvin Harris' new single This Is What You Came For. The two tunes are also up for Best Female Video and Best Male Video, respectively. Beyonce leads all nominees with 11 for her hit album Lemonade, while Adele follows with eight, thanks mainly to her comeback single Hello, from her latest project, 25. The 2016 MTV Video Music Awards will take place at the fabled Madison Square Garden on 28 August (16).